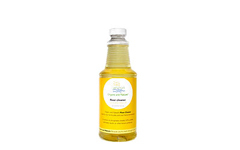 Organic and Nature's Floor Cleaner is safe for your baby and your home environment. It contains no phosphates, nitrates, NTA, sulfates, sulfonates, caustic or other known pollutants. This Floor Cleaner is a concentrated formula and is safe and effective for use on hard nonporous surfaces, such as varnished and polyurethane floors, finished wood, tile, linoleum and vinyl. The advanced formula lifts and traps dirt molecules, leaving behind a clean you can see and a fragrance you will enjoy. The fragrance is a unique blend of essential oils including Lemon Oil, Grapefruit Oil, Orange Oil, and Tangerine Oil for an elegant aroma. Why bring toxins into your home? Non-toxic floor cleaners are superior to harsh toxic chemical cleaners for Indoor Air Quality. This cleaner will not harm trim, painted or varnished wood, or other delicate floor surfaces. Ingredients: Natural plant-based surfactant, natural spring water and a natural essential oil blend, including Lemon Oil, Grapefruit Oil, Orange Oil and Tangerine Oils. Available in Grapefruit, Lavender - This blend of essential oils, including Lavender, Cedarwood, Lemon and Patchouli leaves an elegant aroma. Lavender has long been coveted for its aromatic benefits as a natural relaxant, revitalizer and disinfectant. Unscented - This unscented formula is ideal for sensitive skin, for people sensitive to scents and perfumes, or for those with asthma or allergies. Contains no scent, or dyes.